First of all, congratulations on completing the game. 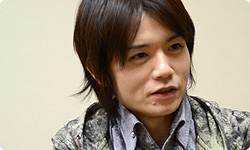 I was able to play the final version before this interview, and its richness, and an unparalleled sense of volume really came across, just like when I played Super Smash Bros. Melee and Super Smash Bros. Brawl1 for the first time. 1. Super Smash Bros. Melee and Super Smash Bros. Brawl: The first game in the series, Super Smash Bros., was released for the Nintendo 64 system in Japan in January 1999. The second game, Super Smash Bros. Melee was released for the Nintendo GameCube system in Japan in November 2001, and the third game, Super Smash Bros. Brawl, was released for Wii in Japan in January 2008. 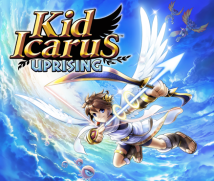 Broadly speaking, the Kid Icarus: Uprising game has two modes, right? Yes. A single-player story mode and a battle mode for up to six players. When I saw the battle mode, one of the things I thought was that this was how the Super Smash Bros. games would look like in 3D. In many ways, like the fast pace, for example. I think a good number of people feel the same way. I think some people, when they first saw the multiplayer battle video for Nintendo Direct this time2, were taken aback by the whirl of activity. 2. 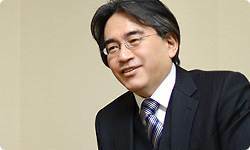 Battle video for Nintendo Direct: The Nintendo Direct held on February 22, 2012. Nintendo Direct is an Internet presentation where Nintendo directly delivers the latest information on its products. Actually, many people now know what kind of game Super Smash Bros. is, but when we first announced it for Nintendo 64, people didn’t fully understand its concept right away. It’s easy to misunderstand things that look similar but are actually completely different. So I’m worried that people will misunderstand battles in Kid Icarus: Uprising as well. For example, the rules are somewhat like that on an FPS3, but there are only three controls in this game compared to more than ten that you can find in a standard FPS game. 3. FPS (First-person shooter): A genre of shooting game with 3D space displayed from a viewpoint as if the player him or herself is in the game. With Kid Icarus: Uprising, you only use the Circle Pad, L Button and stylus to control the game. You use the Circle Pad to move, the L Button for attacks, and the stylus for aiming A crosshair appears on-screen in the same way as an FPS, but this game is something of a very different nature. Once you play it, I think people will understand that these controls make sense. When Super Smash Bros. came out, regardless of its distinctive strategic elements, people compared it in the context of previous fighting games, and some had said, “It’s approachable, but a little bland and shallow.” So after the game went on sale, we started the Smash Bros. DOJO! !4 website and visited media entities and people who looked like they might understand and explained it to them in our efforts to continue communicating the appeal of this game. This was around 1999, before I moved to Nintendo. 4. Smash Bros. DOJO!! 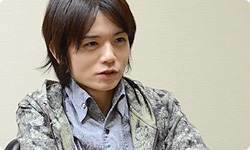 : An official website for Super Smash Bros. where game creator Masahiro Sakurai explains the controls, offers advice on how to enjoy the game, and introduces stages and characters. Back then, unlike today, it was not common to talk about this kind of information through the Internet, and Super Smash Bros. looked at first glance like it was similar to games up to that point, but it wasn’t, which was difficult to convey. It took quite a lot of time and energy until Super Smash Bros. spread to a large number of people. Yes. But eventually it found a broader support base. That’s part of my style, you might say. I think more people are starting to pick up on it. What exactly is your “style”? Not just Super Smash Bros., but the Kirby Air Ride5 and Meteos6 games were like that as well. 5. Kirby Air Ride: An action racing game released for the Nintendo GameCube system in Japan in July 2003. 6. Meteos: A puzzle game released by BANDAI Co., Ltd. (now NAMCO BANDAI Games Inc.) for the Nintendo DS system in Japan in March 2005. Like the more you chew it, the more flavour comes out? Rather, since the rules are so different from convention, people who are especially used to games may have a difficult time comprehending it at first. Trying it a little isn’t enough to immediately understand how fun it is, right? Right. I don’t at all intend for it to be that way, but there seems to be a hurdle at the start. Of course, people do take it different ways and have their own preferences. Is that because when you think about the structure of a game, you don’t use the conventional game flow but add in twists and changes? It isn’t twists and changes so much as disassembly and reassembly. Disassembly and reassembly? In other words, you break down the elements of conventional games and then reconstruct them your own way. That’s right. For example, there are all kinds of game genres, like fighting games and puzzle games, and each one has its own “fun core.” First, I try taking away everything unnecessary around that core. Yes. Then, it’s like I place the fun core somewhere else and build around it again. What kind of disassembly and reassembly was there for Kid Icarus: Uprising? That’s difficult to explain. No matter what I might say, there are parts you can’t understand without actually playing it. Oh. Then can you explain disassembly and reassembly using as examples games that everyone knows, like Super Smash Bros., Kirby Air Ride or Meteos? It applies to so many things that if I were to explain what lies behind Super Smash Bros., it would fill one or two whole books! But I do think I could offer a simple explanation about some standout elements. I’ve told you about how we originally made Super Smash Bros. as an antithesis to 2D fighting games, haven’t I?